Queensland football received a massive boost in 1974 when the State won their first Section 2 national title. Following this success the Queensland uniform received a complete overhaul. 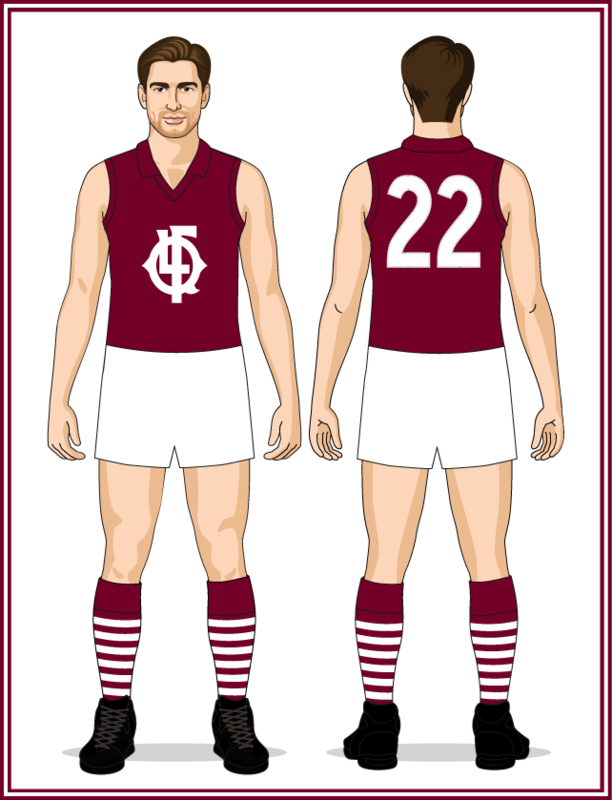 Gone was the plain design of 1974, replaced by an impressive new design that returned the "Q" to the front and centre of the jumper via a QFL monogram. This was paired with an all-new sock design similar to that first seen on the Queensland uniforms of 1884-88. - neck/collar/shoulder trim changed from maroon to white. - the v-neck was much thicker than normally seen on Australian football jumpers. - the QFL monogram was bigger. 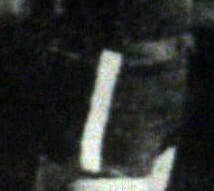 - a thick white stripe was added to the front and rear edge of the shorts (see image at right). - the hoops on the socks were changed to the standard thickness of the modern era. (it's not known if the remaining one was named Jack or Meg!). - the socks were changed to all-maroon. 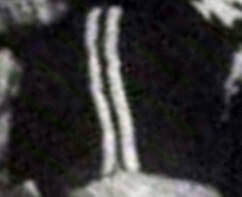 - first appearance of the iconic QAFL logo on the State jumper. 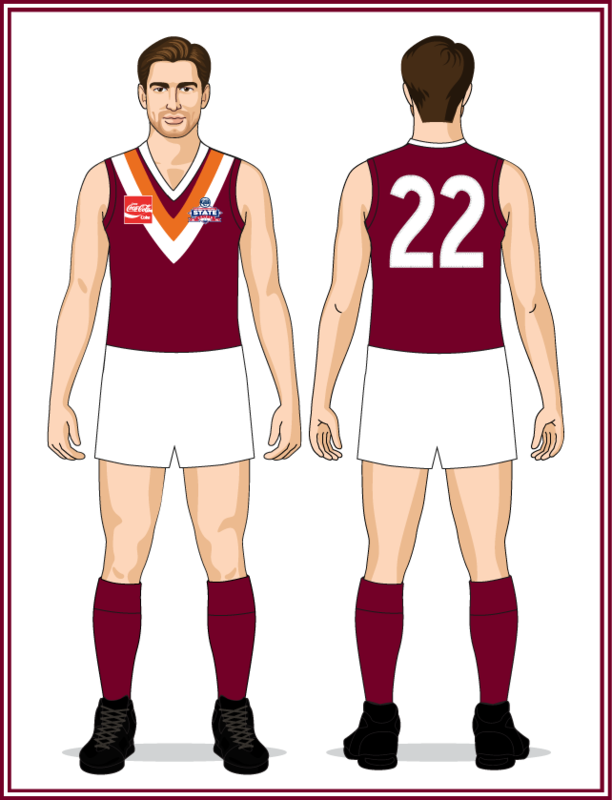 - the logo of Queensland's apparel sponsor Peerless was also added to the jumper front. (Peerless were better known at this time for manufacturing most of the rugby jerseys worn throughout Queensland and New South Wales). - first collarless Queensland jumper. - v-neck returned to standard width. - white stripe dropped from the side of the shorts. 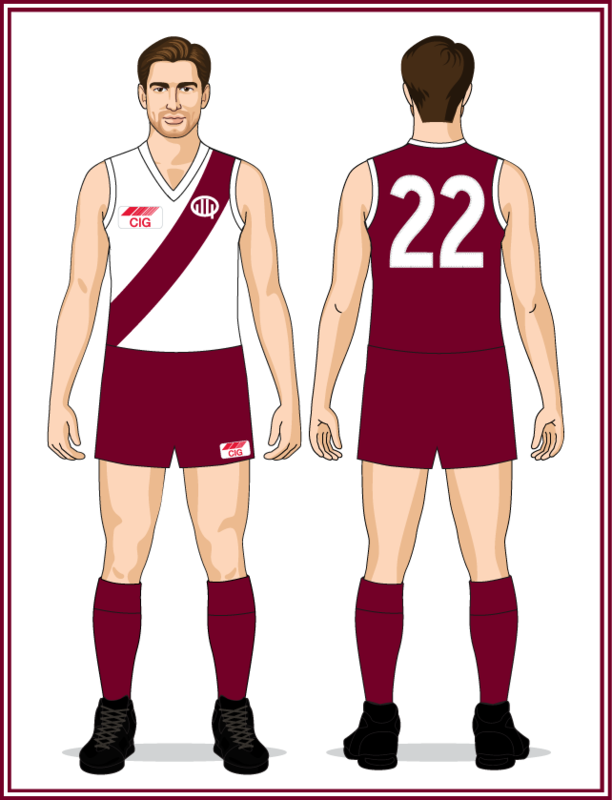 The first version of the sash design that for most modern fans remains synonymous with Queensland's interstate teams. The sole difference between the 1980/82 version and 1981 is the socks. In 1981 the classic design (worn for many years prior to 1975) made a brief comeback before the State team reverted to all-maroon socks in 1982. This design was also the first to include American-football style numbers. 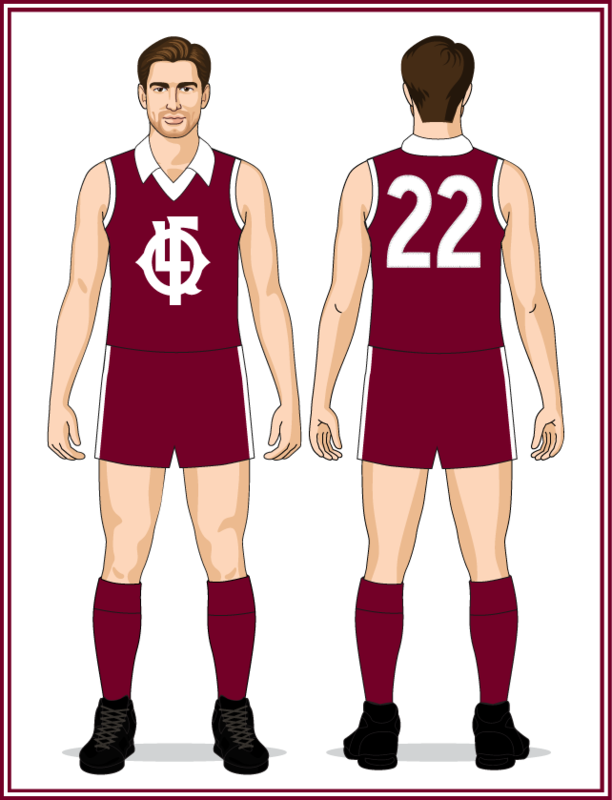 These were later adopted in 1982 by all WAFL clubs and appeared on the 1983-84 Western Australian State jumper. - the neck and shoulder trim changed from maroon to white. (previously it had finished against the shoulder). - sponsor patch changed from Peerless to CIG. - rear numbers remained in the American-football style font but were increased to normal size. (it ended fully against the shoulder instead of between the neck and the shoulder). - sponsor logo (CIG) worn on the shorts for the first time. - rear numbers changed to standard footy font. Return to the original 1980-82 sash placement (see below for a comparison of how the sash was worn throughout the 1980-89 era). - the CIG sponsor patches were updated with the company's new logo and colour scheme. - the shorts patch was worn on the opposite side of the shorts. 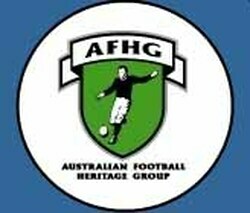 This representative match against the NSWAFL was played as a curtain-raiser for the State of Origin match. 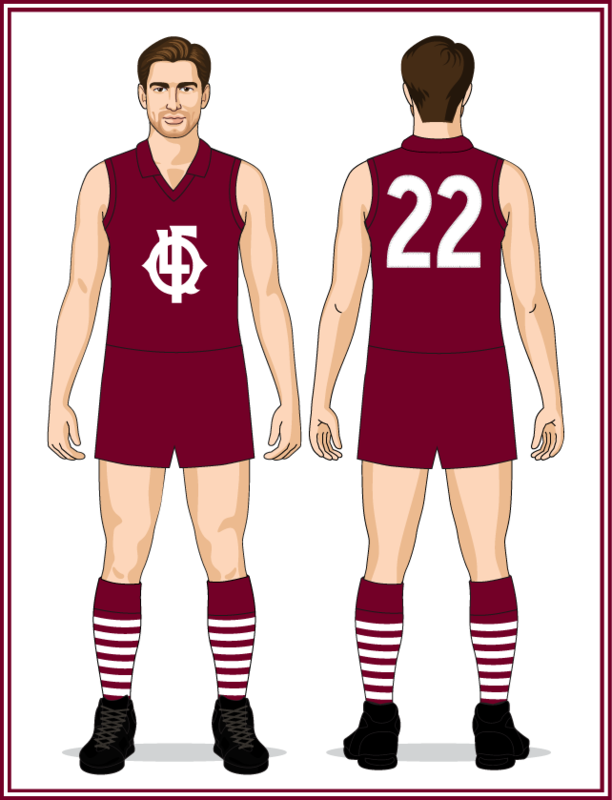 The design of the uniform is known (maroon with white stripes - same as the Origin jumper) but the various sponsor patches on the jumper are not known. Queensland celebrated their first Origin match since 1988 with a new uniform, reminiscent of Port Adelaide's famous "prison bar/wharf pylons" design. For the big match against Victoria a Suncorp sponsor patch was worn alongside the QAFL logo. 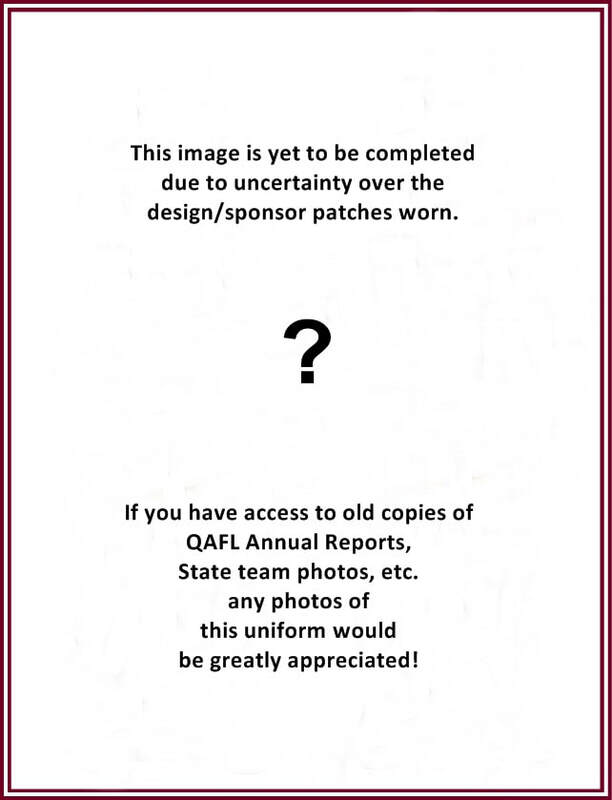 An AFL State of Origin patch appeared above the QAFL logo. The exact layout of the patches on this uniform are also unknown. It is known that the QAFL logo and the 1992 AFL State of Origin logo were worn but it remains unconfirmed if there was also a sponsor's logo on the jumper. As with the representative jumper, if you have any further info please contact me. This representative match against the TFL was played as a curtain-raiser for the State of Origin match and the Queensland striped uniform was paired with a Coca-Cola sponsor patch and QAFL logo. For Queensland's third AFL State of Origin match the State team joined forces with the best Northern Territory-born players to ensure the widest array of AFL talent took the field. This was the first combined Queensland-Northern Territory representative team ever selected. A new composite jumper was designed featuring the maroon and white of Queensland and the ochre and white of the Northern Territory. In this author's opinion, the design fell just short of being an instant classic because of one simple design error - the white neck that clashes with the ochre and white vees. See the image at right for an idea of how perfect this jumper would have been if the neck had been maroon instead. How good it would have looked with a maroon neck! The same uniform the QAFL wore for their clash against the TFL the previous season. 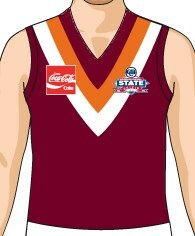 The sponsor patch changed from Coca-Cola to Bank of Queensland for this representative match against the WAFL. It remains unknown what uniforms were worn during this period, what patches appeared on the uniforms, even how many representative matches were played during these years! I'm aware of the QAFL playing rep matches against the Victorian Metropolitan FL in 1998/99 but that's the limit of what I have been able to find. If you can provide further info please contact me.